Call 630-665-1200 for an appointment or to verify hours. Special Pricing for our Quick Delivery Homes! The Villas of Ginger Woods Community is developed and designed with your comfort, convenience, and confidence in mind as you buy a new home. 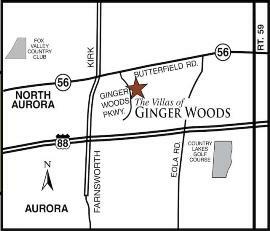 Located in a serene environment within Aurora, Illinois, just north of the Premium Outlet Mall, with convenient access to I-88, the Villas of Ginger Woods new construction townhome community offers a quiet private location with abundant green spaces. For your Comfort, we include with every home, an Energy Efficient HVAC with humidifier and a programmable thermostat. Relax on the standard private patios. Tread on our standard hardwood floors. Notice our taller sink heights in the master baths. Feel our Solid Surface Countertops. First Floor Master Suites are in all of our floor plans and dramatic vaulted ceilings are in most great rooms. We know our customers appreciate even the smallest details such as Kohler Wellsworth elongated toilets, beautiful framed mirrors in the baths, and elegant standard lighting packages. For your Convenience, the new construction homes at the Villas of Ginger Woods allow you to throw away your shovel and sell your lawnmower. 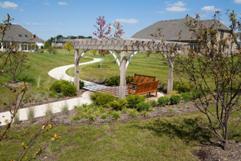 Exterior maintenance such as lawn care, snow shoveling, and lawn irrigation is included in our community. 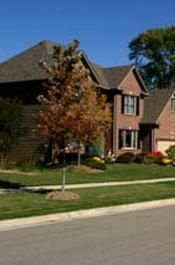 We detail with each home a keypad entry for your garage door and stainless appliances. 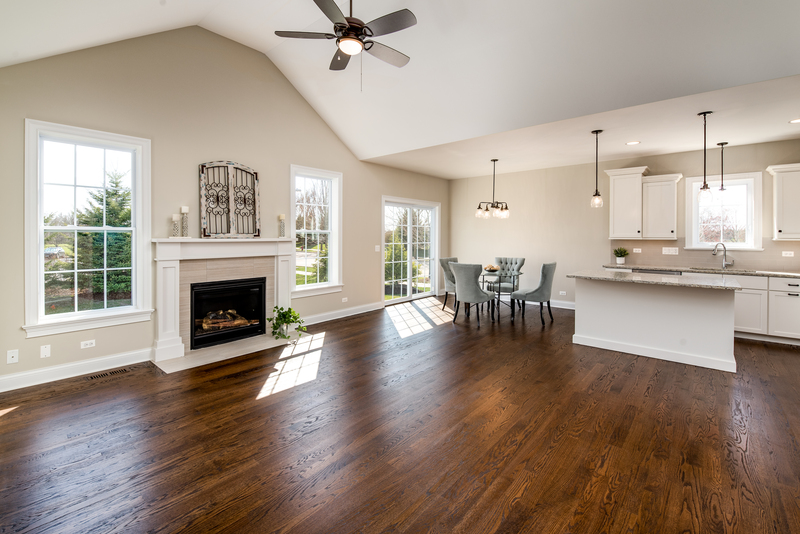 How practical it is to have wiring in each bedroom and den for Ceiling Fans, generous cabinetry in the laundry rooms, and a custom separate mailbox near your home. Don't forget convenience as it is centrally located - 12 minutes to downtown Geneva, 15 minutes to downtown Naperville, 20 minutes to Oak Brook, and convenient to I-88 to get you anywhere in Chicagoland! For your Confidence, we include with every home a Thermacrete Common shaftwall with extraordinary sound deadening and fire rating. The gas cooking appliance is vented to the outside. Moen Faucets are in our baths and kitchens. Notice our Recessed can lighting in the kitchen and hallways. Versatile full basements and Roughed-in Bath Plumbing are included plus Concrete Driveways and Brick Fronts as well as low maintenance fiber cement siding. Take assurance from our 1 Year Limited Home Warranty. Experience yourself how we care for your Comfort, Convenience, and Confidence. Click on the links below to view our site plan, floor plans, current pricing and standard features. Please note that prices and features are subject to change without notice. 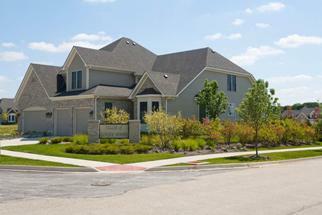 Come see our Models which are open by appointment and MOST Saturdays 1-4pm. Call 630-665-1200 for an appointment time that is convenient for you. For More Information Contact Melanie Young at 630-665-1200.